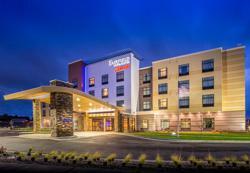 The 82-room hotel is within feet of the Fieldhouse and Pentagon and is the housing hub of the Sanford Sports Complex. Only Fairfield Inn & Suites by Marriott® gives you confidence that your trip will be a success because we consistently deliver a hotel experience that's just right. We provide you with just what you need, and skip what you don't, so travel is easy and productive. Our knowledgeable and courteous staff is available to help 24 hours a day. Take advantage of our complimentary amenities at every Fairfield Inn & Suites, including breakfast, in-room high-speed Internet and Wi-Fi in the lobby. Enjoy comfortable and spacious guest rooms that allow you to work and relax.